Bat Survey Solutions, LLC is led by professionals with training in Design, Education, Information Technology, Photography, Technical Writing, Wildlife Biology, Videography, and other complementary disciplines. We provide integrated instruction and field services to address a full range of bat study and management concerns. BatSS staff bring decades of experience to every project and program. Our mission is to empower others with the resources needed to effectively and efficiently manage bat populations in North America and beyond. The core services we provide are field-survey training workshops that focus on integrating acoustic monitoring with bat survey efforts. Each year, we teach complementary courses in Acoustic Data Management, Bat Detector Survey Methods, and Combined Field Survey Techniques that are ideal for bat workers at any level. Pettersson bat detectors are prominently featured in every training class we offer, and our staff are proficient users of the entire Pettersson product line. Yet, we also acknowledge that if researchers rely on just one detector type or software platform, then the data reflect just one opinion of the bat species present, so our workshops do not focus on one proprietary system, but teach students how to get the best results from any detector make or model. These courses are designed around a 5-day schedule of combined classroom lectures and hands-on practice. The Acoustic Survey Methods curriculum teaches students all the topics covered in the basic “Acoustic Data Management” class, but combine them with in-field demonstrations and practicums. 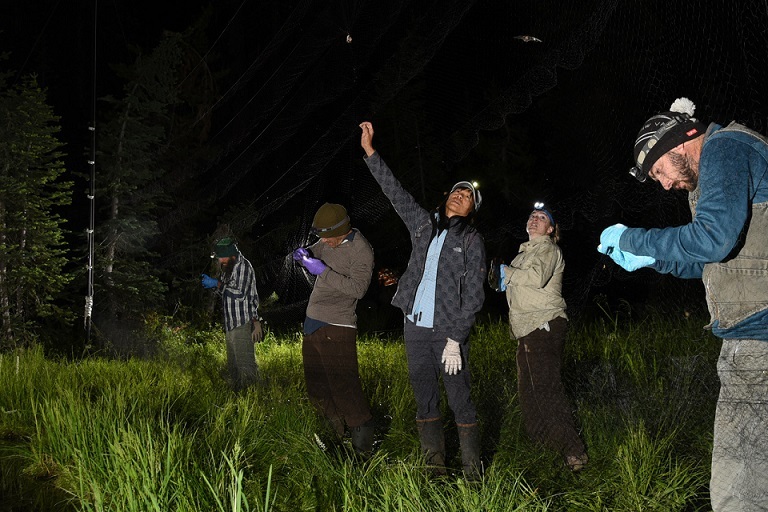 Structured outdoor field trips at venues and during times conducive for intercepting wild bats, allow us to illustrate how to locate, deploy, collect, and analyze real data from active, passive, and mobile acoustic transect surveys. Our 8-day/7-night field workshops provide guided, hands-on experience with bat survey techniques including harp traps and single-, double-, and triple-high mist net sets, as well as bat handling, removal from nets and traps, identification, banding, WNS decontamination and disinfection techniques, echolocation call recording, and data processing. Radio telemetry, video-recording methods, and a full range of active, passive and mobile acoustic-survey techniques are highlighted. Students learn how to integrate acoustic monitoring as a survey technique for effective, efficient comprehensive bat surveys. Workshops are conducted at our three flagship venues in Arizona, California, and Kentucky where we have been working with local partners for more than 20-years to survey and monitor the area bats and guarantee students unparalleled bat diversity and handling experience. In a 3-day classroom setting, students learn about the theory behind recording and analyzing ultrasonic bat vocalizations. 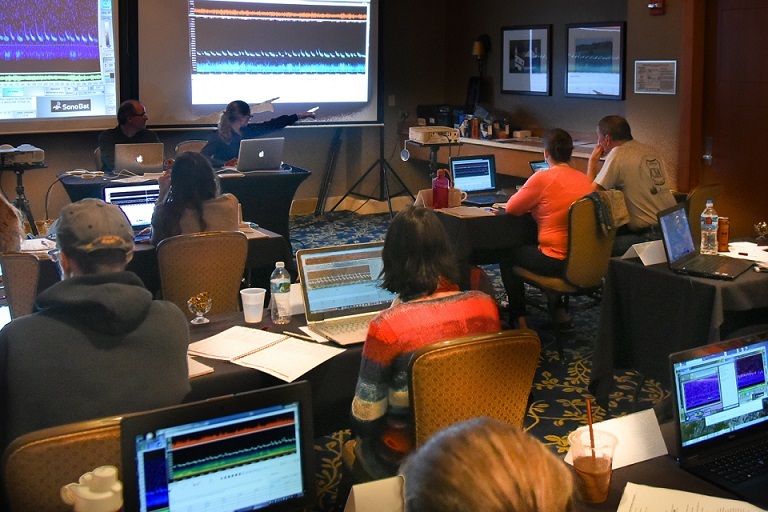 We teach participants how to interpret quantitative analysis outputs from auto-classification software programs and how to perform qualitative analysis (i.e., manual vetting) to confirm bat species presence. These classes are crucial for anyone conducting acoustic surveys and provide countless tips and tricks for running auto-analysis programs. They have been described by past participants as the "hidden user's manual" for the four main software programs currently available.